Developed by CoreCivic's Reentry Services team, Go Further is an evidence-based process that unites facility leadership, staff, and those in our care toward one goal: successful reentry. With Go Further, reentry planning begins at day one of incarceration and continues throughout an individual's stay. After careful assessment, a life plan is developed to address certain deficits and potential barriers to reentry such as: educational needs, substance use disorders and life skills needs. 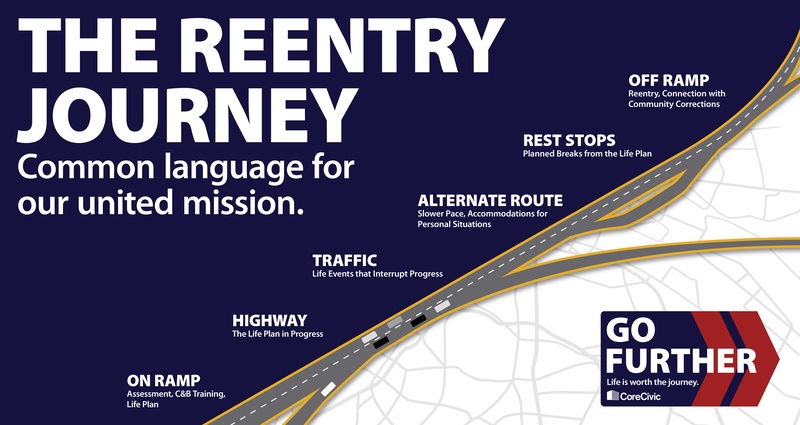 Modeled on the theme of a highway, Go Further uses a common framework and terminology for a shared understanding of the entire reentry process. Through Go Further, we can reduce recidivism by providing access to educational courses and training workshops in areas like behavior modification, career counseling, life skills, and through academic and vocational coursework. Likewise, Go Further provides access to rehabilitative services including substance use disorder treatment programs, mental and health care services, release planning services, and reentry support for those in our care. As individuals near release, there are opportunities for work furlough and residential reentry programs. Go Further provides supervision via case management, coordination of compliance with conditions of release, coordination of legal, social and psychological services and monitoring services. See how Go Further is preparing individuals for reentry with stories from our Northwest New Mexico Correctional Center and Lake Erie Correctional Institution in Ohio.